When a film’s themes and characters continue to haunt you, it is a sign that the picture is one worth sharing. Like Yuichi with Mitsue, be patient and get to know and feel these characters, and you will not be disappointed. 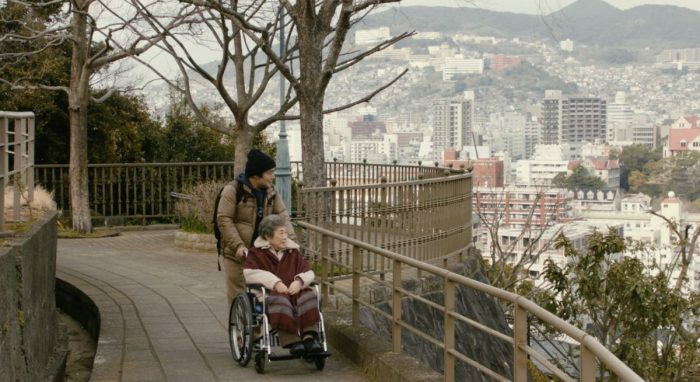 Based on a manga by Yuichi Okano, Pecoross’ Mother and Her Days is a touching and intermittently funny portrayal of the relationship between a son and his ageing mother, suffering from dementia since the loss of her husband. Yuichi (Ryo Iwamatsu), also known as Pecoross due to his baldness (‘pecoross’ means small onion in Japanese) is a goofy, middle-aged man. He is laid-back, passionate about performing his own songs live and draws manga. He is not so passionate about his job as a (unsuccessful) sales employee. Yuichi lives with his mother, Mitsue (played by the poignant Harue Akagi). Set in a peaceful Nagasaki neighbourhood, Yuichi’s daily life is coordinated around taking care of his mother. A series of troubling yet comic events associated with her condition punctuate his days. Yuichi also lives with his son, Masaki, a more mature personality than his father. It is Masaki who initiates the conversation about the painful necessity to place Mitsue in a specialized home. Mitsue is moved into a home with other elderly women and men, all experiencing dementia and Alzheimer’s. From this point on, the film becomes increasingly personal and intimate. One may even suggest it is a plot within the plot. 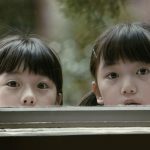 The film not only develops the issues surrounding ageing (a consistent subject of discussion in Japan for decades now, more so than any other nation); it is also a tribute to mothers, as well as women, in post-war Japan. On her own, in her room at the care centre, Mitsue’s flashbacks become more frequent. It is hard not to be swept up with emotion while the film sinks deeper and deeper into her mind as she recollects key figures and relives key moments. These regular flashbacks to the 1940’s and 1950’s are a window into Mitsue’s past and hardships. One is flung into Japan’s bitter history: World War II, the atomic bomb destroying Nagasaki, the tragic lives of geishas. “You’re so strong” says her husband (twice) as they are finally able to walk into their new home thanks to Mitsue’s strength enabling the door to finally slide open. The use of flashbacks is the film’s greatest strength. They reveal Mitsue’s identity and the special relationship she has with her son and other significant individuals. Her strong ties to them reach an apotheosis in one of the film’s most moving and beautiful scenes, at the yearly Lantern Festival. Pecoross’ Mother and Her Days is clever, moving, serious, amusing, a genuine and charming portrayal of family relationships…and much, much more. This entry was posted in ASIA, Reviews and tagged Azuma Morisaki, Harue Akagi, Japanese films, Pecoross' Mother and Her Days, Pekorosu no haha ni ai ni iku, Ryo Iwamatsu. Bookmark the permalink.